Network analysis is a research approach that is suited to describing, exploring, and understanding various types of structural and relational aspects. Important contributions were made from an extremely wide variety of fields, including sociology, psychology, political science, anthropology, communication, business, mathematics, statistics, computer science, and physics. A history of network analysis approaches can be traced back to the Eighteenth century. In that century, European mathematician Leonhard Euler used a visual representation of a network of bridges and rivers to solve the now famous Königsberg bridge problem. The problem asked if it was possible to walk around the town of Königsberg, crossing each of its seven bridges only once, and returning to the point of origin. By portraying the bridges and land as points with lines between them, Euler determined that no such path existed owing to the number of nodes and links. In doing so, Euler invented graph theory, which provides one of the mathematical foundations for network analysis. Later, throughout the 1800s and early 1900s social scientists posed questions about social relations and developed theories and terminology to describe social connections and social structure. In 1929 a new idea about ties between people was proposed in a short story by Hungarian writer Frigyes Karinthy. In the story, a character asserted that he could link anyone in the world to himself through at most five acquaintances, proposing what may be the first mention of the concept of six degrees of separation. In the 1920s educational psychologists published a number of studies reporting on characteristics of social ties such as influence, interaction, and companionship. Major contributions to the method were made in 1934 by psychiatrist Jacob L. Moreno. Moreno developed a new way of representing relationships on paper, called a sociogram. A sociogram was a drawing with points representing people connected by lines representing interpersonal relationships. Morenos work established network analysis as a unique discipline, and his sociograms were the first specific network analytic tool. In 1959, mathematicians Paul Erdõs and Alfréd Rényi, found out with their model that the larger the size of the network, the fewer connections between network nodes were needed to have the network be completely linked. In the early 1970s sociologist Mark Granovetter posited that, in addition to strong ties to families and neighbors, each person has certain weak ties to casual acquaintances and that these weak ties hold a network together. Herein, the acquaintances and friends of friends could reach outside what might otherwise be closed and therefore allowed a larger network to form. Granovetters work was important for several reasons; it helped the development of a sophisticated and realistic model of network structure. Furthermore, Granovetters work was among the first applications of network theory, which attempted to explain social structure and human behavior. Granovetters findings led to a deeper understanding of how knowledge and information can be efficiently passed through large social networks. In this section, I will discuss different approaches to social network analysis. My main focus will be network analysis in terms of communication, more specifically Social Media. The reason for this is that there are so incredibly many approaches to network analysis and I don´t have time or space enough to write about them all in this assignment. So this is a way to refine the assignment. In today´s digitized social network-analysis is a good way of understanding how we interact with one another on social media. You can for example apply social network analysis on Facebook to reveal the relationship between agents in this specific medium or in one specific Facebook-group by analyzing who communicates with whom, what they talk about, how often they communicate and where they communicate (through chat, on the wall of the group etc). For this type of analysis you can for example use the Barnes fish net model. J. A. Barnes uses a the fishnet to show the complexity of a social network, in this example Facebook. The network in the fish net visualizes how people are related to each other through contact and interaction. Or as Fyrand (2005) says it: "The knots in the yarn represents actors and threads between nodes visualize the relationships between actors ". with now in Amsterdam  yeah, people who have the same status as me. Since we live in a digitized world there is of course many apps you can use to do a social network analysis. And the great thing is that they do most of the job for you. However you have to do the job yourself If you use Barnes fish net or regular Actornetwork theory (ANT), a theoretical approach to social science that attempts to describe how actors in a society behave and interact.1 ANT is a heterogeneous network in which humans and non-humans are included as participants, where the relationship between the actors and their characteristics are essential, not their acquired or inherited characteristics. But anyways, as mentioned there are easier ways to find out about actors and their relations. If you want to do a social network analysis on Facebook for example, you can choose between Social Graph, TouchGraph Photos, NameGenWeb, Friend Wheel and of course Gephi. 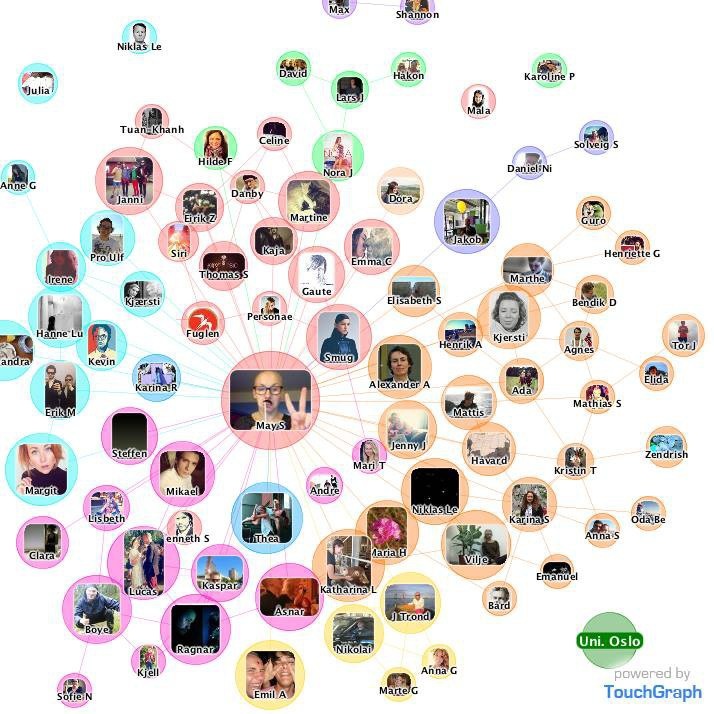 If you are more interested in the social medium Twitter you can use Mention Map. All these tools are different approaches to analyzing different relations on social media. I will now write short about each tool. The  social graph essentially refers to "the global mapping of everybody and how they're related. Mark Zuckerberg is a huge fan of this app. He wants to connect Facebook with parts of the Web that other social sites are building and he describes this as the  Open Graph. These connections aren't just happening on Facebook, they're happening all over the Web, and today with the Open Graph we're bringing all these things together, Zuckerberg claims. 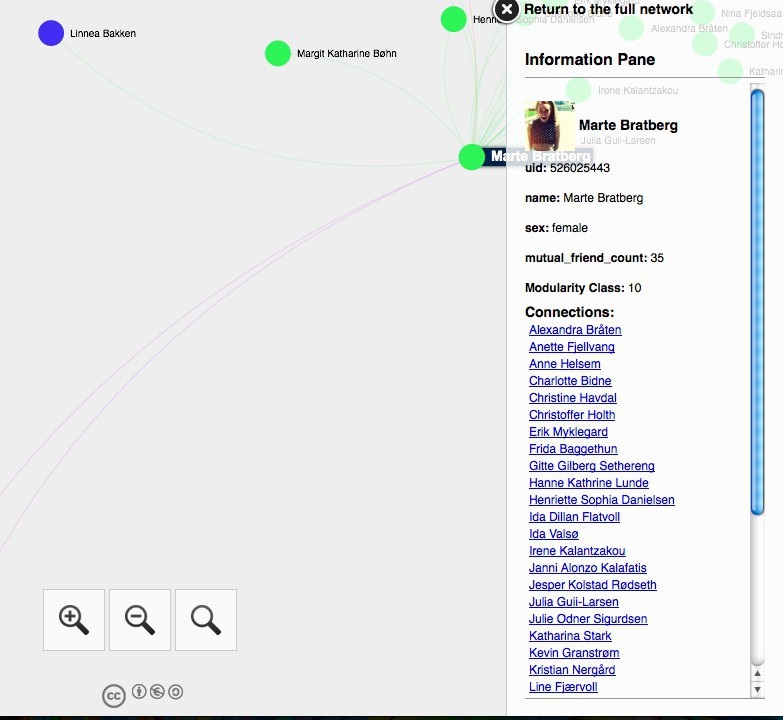 NameGenWeb shows social relations between people (actors) on different social media. I applied it on Facebook and got this result. The different colors shows the connections between people and the different networks they belong to. You can search up a name and see which people this person knows and how he or she is related to me and other friends and how many mutual friends we have. And you can also select a color and see which people who are connected in this specific Facebook-network. Friend Wheel shows all your friends on Facebook and what the link between them is. Friends are connected by lines and you use the mouse wheel to zoom. Hove over friends to see their links. To produce a network, two inputs are needed: a list of the actors composing the network, and a list of the relations (the interactions between actors). As part of a mathematical object, actors will then be called nodes, or vertices, and relations will be denoted as edges. To use  Gephi to do a network analysis of your Facebook data you have to download myfnetwork from Facebook. Then you get the data you need. After that you import it in Gephi. Unfortunately the myfnetwork app was down so I was not able to test it myself, but I found an image that illustrates the different graph you can get out of different social network analysis with Gephi. Precursor of network analysis is graph theory, a mathematical approach to construct networks in the form of graphs. With this method one can calculate certain distances between several spots (nodes), for instance in an infrastructure. Also the importance of the points and incoming and outgoing lines (edges) between them is weighted and enables calculated conclusions about the networks infrastructure. Graph theory is a branch of mathematics, concerned with the form of structures, the topology. Graph theory offers measures to represent the principal features of social networks, but it cannot be fully applied by sociologists. This forms the start for a different way of analysis, in the light of sociological studies. In the last forty years, network analysis has developed itself as a fruitful approach to the analysis of social structures. Although it seems to be a recent innovation, used as a specialised technical method by sociologists, it is as old as sociology itself and it has been used in various other disciplines for many years. In the 1930s Moreno developed sociometry to structuralize the relations among small groups of friends. The popular persons within this web were called hubs; lines with friendship choices surrounded these. Later on in the 1950s Bavelas and Festinger focused more on studying the group dynamics in the light of American social psychology. John Barnes was the first to coin the term of social network (Barnes 1954). The object of study moved from individuals or groups to African tribal societies and urban communities in Britain in the field of anthropological studies. The studies on British families expanded in researching the communal patterns of neighbouring and working by Banton (1966). In general, social psychologists tend to look more at the centrality of different actors in the patterns of the network, while sociologists and anthropologists were more inclined to the density or connectedness within a large network. In the late 1970s the Digital Revolution took place, which implies a change from analogue mechanical and electronic technology to digital technology. From the 1980s on digital computers have been increasingly crucial not only to institutions, but also to individuals. Computer sciences have been a research field since the 1960s and developments in the field of non-trivial networks have been made during the Cold War era. These communication driven networks have been fundamental to the entrance of the Internet, which is a physical network of computers, linked together by optical fibre and data connections. After that, the World Wide Web in 1990, a network of Web pages containing information, linked together by hyperlinks from one page to another without natural or chronological order. These scale-free network structures gave breath to the online social media networks from the beginning of the 21st century. Altogether, this changed the way of analysing networks in two ways. First, the size and the character of the networks itself changed, which made the study of object different than before. Second, the way of analysing the networks changed, because of the introduction of software programmes that could help gather Big Data-input and create a more advanced visualisation as output. The Small World Phenomenon, also known as the six degrees of separation, which accrues from the analogue social network analysis and is tested by Stanley Milgram in 1967, can be easily tested digitally through an online social network, like Facebook. 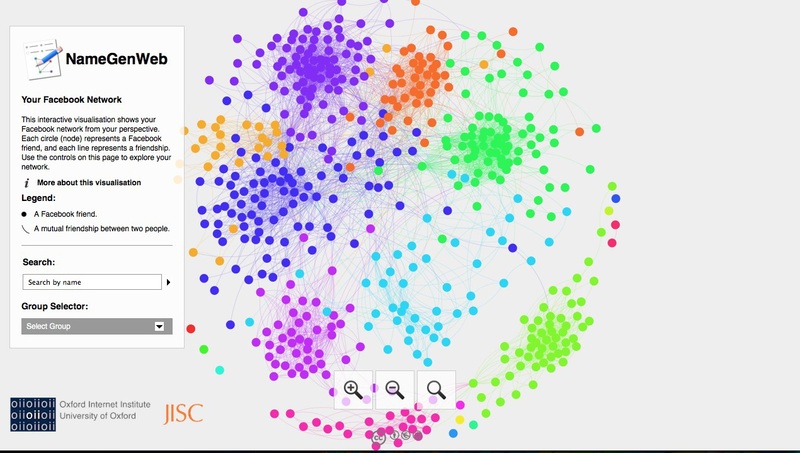 The potential to create complex networks and refined visualisations opened a new world of possibilities for both qualitative and quantitative research of network analysis in the field of social sciences, information sciences and economics. Improvements in organisational, environmental, health and social optics have been enabled by the digital network analysis. One of the obvious advantages in doing network analysis is that very complex and incomprehensible amounts of connections can be made clear and structured. This way conclusions can be drawn about a large quantity of connections that otherwise would seem irrelevant or too complicated. In the political case example, the use of certain words can be linked to the voting behavior of respectively democrat or republican voters. Without the use of network analysis this specific kind of research into voting behavior would be almost impossible. Another advantage of network analysis can be seen in the work of Florence Nightingale: by analyzing all the different causes of mortality and connecting them in a comprehensive network, the military could take adequate measures to prevent a significant number of deaths. This example shows that by using network analysis, you can literally save lives. In the digital age the advantages of network analysis are being used more and more. If it is by connection with all your real life affiliates online in networks as Facebook, Twitter or Google+, or by using your network to find a job or search for the right employee on LinkedIn; the ways in which you can expand and use your network by analyzing the different connections are huge. Because of all the criteria that can be analyzed the possibilities for doing an exact search can be specified very precisely within the set boundaries. This way the connections between all kinds of people are getting tighter, while the different characteristics of these people can simultaneously be specified and examined. One of the disadvantages of using network analysis is that people might have the tendency to solely focus on the big picture, thus neglecting all the small and sometimes personal/human factors that also play a role in a certain analysis. For example in the Florence Nightingale case, all the cases of mortality are being compiled in a massive death database where every single number represents the death of a human being. By looking at the loss of life in such a calculating way might invoke a certain utilitarian viewpoint that is considered immoral or unethical by some. One of the more dividing disadvantages of network analysis is that researchers only look at networks for reaching their conclusions; thereby overlooking a rather significant number of people that do not participate in those kind of networks. A very relevant example can be shown with online network analysis: because before people can get online they must have access to a number of (digital) resources that require a certain set of funds and skills. Some people simply dont have these and consequently can not be a part of these networks, or the resulting analysis. So the people that are already on the fringes of (online) society are getting more and more polarised because of the disadvantages they have for getting acces to certain networks. And when the instruments that the majority of researchers use include a lot of network analysis, these people wont get included in the result. So they wont get the benefits that can be accomplished by doing these kind of studies. Presentation of data, communication of data. It is strong to the notion of exploration and all about learning something about the data. Underlining the visualization tools as ways to get to research. It becomes an interactive process, by trying to find out things in the data. There have been several studies using visualizations to explore relations, in networks. 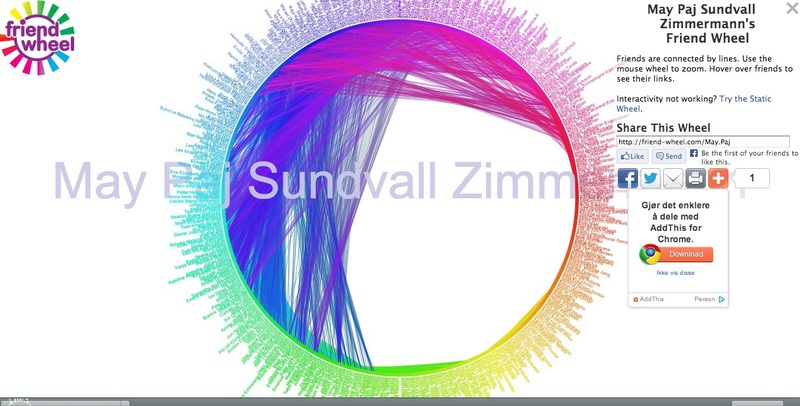 Social network visualizations have always been popular. In these visualizations the relations with people to x fulfill a central role. Through the years there have been many different kinds of x-es. The social has been brought into relation with politics, diseases, war, economics, art and other social elements such as friendship connections. One of the first used network graphs were used by Florence Nightingale. She was able to convince and change a lot through the usage of statistics and the visualization of a network. She was able to show the correlation between the organization of the military (or lack off) and the mortality rate. She used visualization to demonstrate the hidden killer in the army, and vastly decrease the mortality rate. (The figure below shows the total mortality rate, the darkest outer one are the numbers that could have been prevented). In the American elections, network visualization has been used to link certain words and ideas. Republican or democratic sides were linked to words by counting the number of mentioning. This visual helps to see connections between thoughts and sides, a representation of topics? An interactive graphic displaying the number of friends and showing possible (historical) relations to specific countries. Using a program called many eyes it was able to map relations in the New Testament. The network community has produced scholarly journals, such as Connections (founded by Barry Wellman), Social Networks (founded by Linton Freeman) and Social Structure (founded by David Krackhardt). 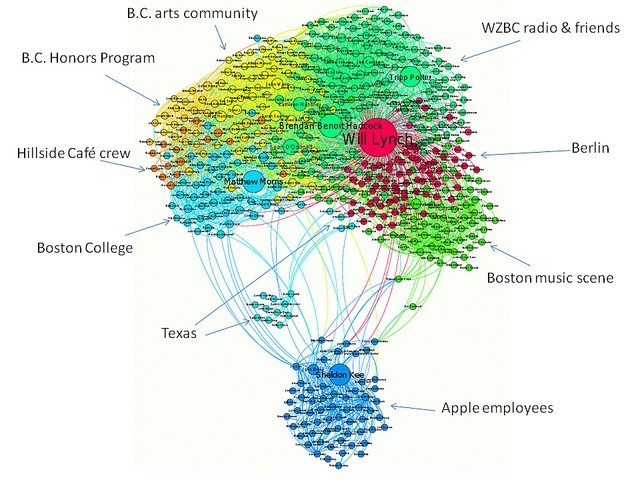 Network analysis is influenced by different research clusters, which becomes evident through the growing interest in social networks since 1990. Jacob Moreno (1889-1974) was a key player for social network analysis (Wasserman and Faust 1994; Borgatti 1997; Freeman 2004). Moreno developed sociometry (1951), a method for studying and measuring social relationships. It forms the foundation for what later would become social network analysis. "The most direct way to study social structure is to analyze the patterns of ties linking its members. Network analysts search for deep structures - regular network patterns beneath the often-complex surface of social systems." Moreno would later add another innovation, namely the sociogram, to his Vitea. That would be a systematic method for graphically depicting the interpersonal structures of groups representing individuals as points and relationships as lines linking between them (Wasserman and Faust 1994). His approach would eventually lead to modern social network analysis. Sociologist Barry Wellman is another prolific scholar in the field of social network analysis. Wellman is quite famous for his international organization that strings Social Network Analysis researchers together. INSNA, a acronym for International Network Society of Social Network Analaysts, is still very influential in the field of social network analysis.. And so is Wellman. Wellman published many research on network analysis (more than 300 articles, chapters, reports and books). He thought of countless new concepts, such as networks of networks and personal community. "Harvard's sociology department became a centre of social network analysis under the leadership op Harrison White. This time period at Harvard has been highlighted by many as the critical moment in network analysis." Under the supervision of professor Harrison White, many Harvard students have published in social network analysis. Barry Wellman was one of them. White wrote a book in which he demonstrated the use of mathematics in sociology, but he is mostly praised for his research with students. More specific: his work on roles and positions. Albert-László Barabási is among the most prominent researchers who have investigated the fault-tolerance of huge networks (2004: 126). The physicist - known for his concept of scale-free networks and his work in the research of netwrok theory  aimed at a broad interdisciplinary approach to the "social network" as a research field of sociology (34). He completed Scale-free networks in 2003. Barabási and his research group introduced in their mathematical model "in systems developing uncontrolled, thus naturally, relations are not established accidentally, the newcomers typically connect to previous nodes." According to Barabási social and biological networks have a power-law distribution. Buchanan M. Nexus: Small Worlds and the Groundbreaking Science of Networks. New York: Norton, 2002. Freeman, LC. The Development of Social Network Analysis: A Study in the Sociology of Science. Vancouver, Can. : Empirical, 2004. Newman, M., Barabási, AL., Watts, DJ.. The Structure and Dynamics of Networks. Princeton, NJ: Princeton Univ. Press, 2006. Freeman LC. Some antecedents of Social Network Analysis. Connections, 19.1 (1996): 3942. Wasserman, S., Faust, K. Social network analysis: methods and applications. In: Structural Analysis in the Social Sciences, ed M. Granovetter. Thousand Oaks, CA: Sage, 1994. Granovetter, MS. The strength of weak ties. Am. J. Sociol., 78.6 (1973): 136080. Kathrine Slettevold. Det sosiale nettverket i en læringsplattform. En sosial nettverksanalyse av kommunikasjonen i Classfronter mellom elever og lærere i en videregående klasse. Master thesis. University of Bergen, 2006. Web. 21 Sept. 2013. Hilstad, Solveig Elsaas. Aktør-nettverk teori. 2001. Web. 21 Sept. 2013. McCarthy, Caroline. Facebook: One Social Graph to Rule Them All? CBSNEWS 21 Apr. 2010 : 1. Print. Grandjean, Martin. Facebook friends network mapping: a Gephi tutorial. Pegasus Data Project 26 Jan. 2013. Web. 21 Sept. 2013. Barnes, John. Class and Committees in a Norwegian Island Parish. Human Relations 7, (1954): p. 39-58. Scott, John. Trend Report  Social Network Analysis. Sociology. Volume 22, Issue 1, (1988): p. 109-127. Moreno, J.L. Who Shall Survive? New York: Beacon House, 1953. Bavelas, A. A Mathematical Model for Group Structure. Applied Anthropology 7, (1948): p. 16-30. Festinger, L. The Analysis of Sociograms Using Matrix Algebra. Human Relations 2, (1949): p. 153-158. Newman, M. The Structure and Function of Complex Networks. SIAM Review, Volume 45, Issue 2, (2003): p. 167-256. Serrat, Olivier. Social Network Analysis. Digital Commons, Cornell University, 2009. Helsper, E. J.Digital Inclusion: An Analysis of Social Disadvantage and the Information Society. London: Communities and Local Government ,2008.